What are keyless door locks? I understand why people are skeptical of keyless door locks and keyless deadbolt locks. However, I believe that most of this skepticism will dissipate once homeowners understand the benefits of these locks. The average homeowner is inundated with many daily tasks, so anything that makes their lives easier is always appreciated. This is where some of the best keyless door locks come into play. Samsung has made huge strides in the world of home automation. Their burgeoning residential product line boasts a widely popular smart home hub and even a security camera that is very easy to set up. In the wake of all these products comes the line of Samsung digital door locks that are quickly picking up steam and on track to be some of the best keyless door locks on the market. The Samsung digital smart door locks have several models that range from mortise locks to deadbolt locks. However, only a handful of these locks are keyless, and I will be focusing on the SHS-3321 deadbolt model for this article. The SHS-3321 is a keyless deadbolt lock with the potential to be one of the best keyless door locks. I say potential because I believe that there are some changes that can be made further propel the lock, but I will address these changes later. Most homeowners that gravitate towards a door lock that is keyless, do so because they want to take advantage of convenience, while simultaneously using a lock that fits a more modern setting. Due to the sleek look and modern feel of the Samsung SHS-3321, homeowners are able to accomplish this, which is why many of them will love this keyless deadbolt lock. Most homeowners will enjoy this lock because it is a truly keyless door lock. Many of the other locks on the market that advertise themselves as keyless door locks or keypad door locks, still have key ways that need traditional keys. Locks that do away with the traditional key way end up being much more secure because they prevent lock bypass methods like lock bumping. 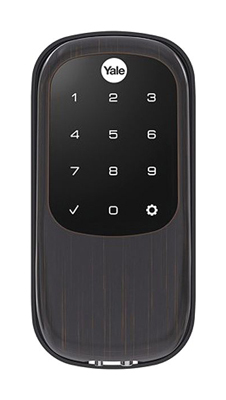 The SHS-3321 lock can be operated by a touchscreen keypad or a RFID (radio frequency identification) key card. The keypad allows homeowners to set a PIN combination that ranges between 4 to 12 digits. In addition to these convenient access features, the lock is equipped with an ANSI certified Grade 1 deadbolt that can withstand a minimum of 10, 75 pound, strikes. The keyless deadbolt lock body itself is made of a zinc alloy that is combined with ABS plastic to cover the keypad. To provide an extra layer of security, the SHS-3321 lock also has a burglar alarm and fire detection sensor built into it. The bolt for this lock is thrown by the torque output that is provided by the motor. The motor and the lock are powered by 4 AA batteries that last an average of 10 months or 3,650 access cycles. There is no traditional keyway, which means that the lock cannot be picked or bumped to gain unauthorized entry. The lock features an ANSI certified Grade 1 deadbolt. The SHS-3321 can be opened by using a security PIN or a RFID key card. The lock is equipped with an internal burglar detection alarm as well as a fire detection sensor. The lock’s motor is powered by 4 AA batteries. If the lock loses power, auxiliary power can be provided to open the door lock so that the batteries can be changed. This keyless deadbolt lock is not well equipped for exterior use. In part, this is due to the composition of the lock body itself. The lock can still be used for internal doors, or for external doors that are not directly in the path of harsh natural elements. As far as the best keyless door locks go, the SHS-3321 is one of the more difficult locks to install, which is part of the reason why it is the lowest lock on this list. Most users have noted that it is extremely hard to carry out a DIY installation of this lock, as many of them had to resort to contacting residential locksmiths to help them install it correctly. Is this door lock keyless? This door lock is truly keyless. The SHS-3321 does not have a traditional key way that can be accessed to control the lock. Not only does this make homeowners less vulnerable, but it reduces the possibility of your keys being lost or stolen. 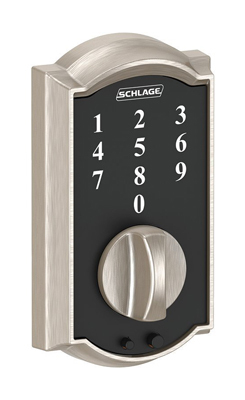 The Schlage Touch series is a series of keyless locks that are offered by one of the most trusted lock brands, Schlage. Similar to other Schlage products, the Schlage Touch locks are great physical security solutions that provide homeowners with robust locks that are difficult to pick and bump. The reason I decided to handle these locks as a series rather than individually, is because each member of the series is virtually the same. The main difference in these locks is the final trim and handle type that homeowners decide to pair with the lock. The series features the Schlage Touch deadbolt, the Schlage Touch lever, and the Schlage Touch with handle set. Aesthetic preference and choice will be the main deciding factor in which lock homeowners decide to use. Each of these Schlage Touch locks is truly keyless and they do not utilize traditional keys or keyways in any way. As we discussed with the lock above, a truly keyless lock helps homeowners guard against lock picking attacks and lock picking attacks. The Schlage Touch locks are each 100% pick proof and 100% bump proof. The slim profile of the lock makes it much more visually appealing than some of the other products that Schlage has to offer, and just like other Schlage products, this lock does not skimp on security in any way. These locks feature an ANSI certified commercial Grade 2 bolt that offers up a good deal of resistance to physical attacks. You have probably noticed that the grade for this lock bolt is much lower than that of the Samsung SHS-3321, but that does not necessarily mean it is a better lock. The Schlage Touch is built for exterior use and this simple feature trumps the SHS-3321 in the eyes of many homeowners. The Schlage Touch locks are each powered by a single 9V battery and these can potentially keep the lock powered for up to 2 years at a time. Although this 9V battery powers the lock, there is no motor present to throw the bolt. Instead, a mechanical thumb turn or lever are used to operate the lock. In the event that the battery dies and the keypad is inoperable, homeowners can provide their lock with auxiliary emergency power with an external battery. Essentially, this process allows users to jump start their locks so that they can regain entry into their homes. The lock comes in multiple trims and finishes which give the more design savvy property owners freedom to customize their lock and choose one that fits their various aesthetic tastes and needs. Each lock in the Schlage Touch series of locks is a truly keyless deadbolt lock, which is one of the main features that positions them as one of the best keyless door locks. These locks are 100% pick resistant and 100% bump proof. The Schlage Touch locks feature strong ANSI certified commercial grade 2 lock bolts. This lock is built for exterior use. The touch screen PIN pad works in extreme weather conditions and it is also fingerprint resistant. The pin pad being fingerprint resistant implies that there will be no smudges left on the lock to indicate your security code. Battery operated lock which will remain functional during a power outage. The lock could be much more secure if the deadbolt was switched out for an ANSI commercial grade 1 bolt. Some homeowners have expressed the desire for a motorized core to the lock as opposed to using a mechanical thumb turn. This feature would elevate the convenience of the lock because it would allow for motorized operation and automatic locking. All the door locks in the Schlage Touch series are keyless. While other keyless deadbolt locks employ the use of mechanical override keys, the Schlage Touch locks allow you to jump start your lock with a battery. This is done to completely eliminate the possibility of someone picking or bumping the lock. Homeowners that seek the convenience of the best keyless door locks are homeowner’s drawn to the finer things in life. These homeowners usually appreciate a sleek and modern design. The Yale Assure Lock attempts to satisfy this desire. The Assure lock is a member of the Yale Real Living Assure Lock series, and it carries on the tradition of trying to give homeowners a seamless keyless option that they can take advantage of. It’s sleek and modern design make it extremely appealing to many homeowners. This lock does not make use of RFID key cards but instead lets homeowners use an illuminated keypad or smartphones as the key to power the lock. The Assure lock is paired with BLE so homeowners can control it over a Bluetooth network directly from their phones. In lieu of this, they have the option of using a 4 to 8 digit PIN code to engage the lock. The fact that this lock is 100% key free means that there are no dangers of the lock being bumped or picked. Also, homeowners will no longer have to worry about getting locked out of their homes and calling an emergency locksmith ever again. In case the lock loses power, it can be accessed through an auxiliary power source, similar to that of the Schlage Touch series that was just discussed. The Schlage Touch series and the Yale Assure lock were in close competition for this spot. However, the fact the Yale series gives homeowners the option for remote access and home automation integration which sets them apart. 100% Key free lock. The lock is operated by via PIN code or over BLE connection. The presence of a weather protection gasket makes it suitable for external use, which means they can be used on most entry doors. A tamper resistant battery cover means that burglars cannot short power to the lock as a means to access your home. ANSI certified Grade 2 deadbolt lock. Home automation integration features allow it to be controlled in multiple ways. The locks is compatible with both Android and iOS devices. Many users have complained that the mobile application used to access the lock is buggy and hard to use. The lock could be improved by upgrading the Grade 2 deadbolt to a stronger ANSI certified Grade 1 deadbolt. The Yale Assure lock is a keyless door lock that can be operated via bluetooth or over a Wi-fi network. There are on traditional keyways present and the lock does not feature a mechanical override key either. This keyless lock is one of the only truly keyless smart locks on the market. The first and most important, thing that you need to know about the Haven Mech door lock is that it is not a traditional lock. This Haven Mech lock approaches the locking mechanism from the ground up, literally. The lock is a flat security bar that is constructed of steel, aluminum, and glass filled nylon. It closely resembles an extended door wedge. This combination of materials already gives homeowners an idea of how robust the Haven lock is. One of the selling points of the Haven lock is the fact that it is 10 times stronger than the average deadbolt. As far as the best keyless door locks go, the Haven seems to take the cake when it comes to security standards. In the absence of a traditional key way, the Haven lock does way with all the inherent flaws of the traditional door lock. The locking bar measures in at 4” x 30” x 0.8” which is long enough to fit the doorway for the average home. The locking bar is placed at the bottom of your doorway and engaged or disengaged to lock and open the door respectively. For those homes that make use of double doors, the Haven lock is still a suitable choice. 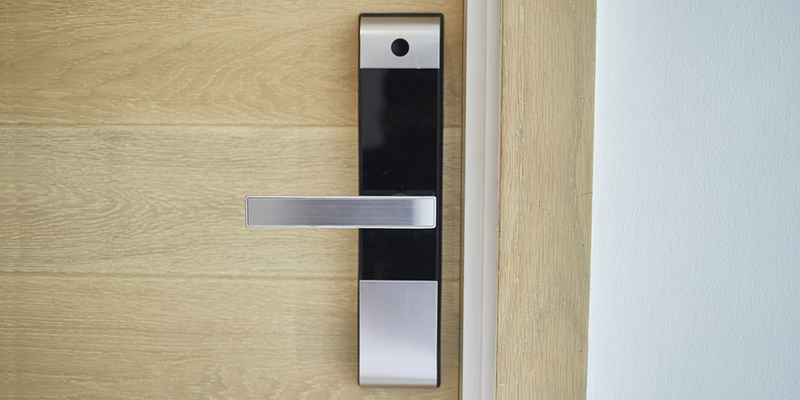 Aside from the security features of one of the best keyless door locks, the Haven lock has wireless connectivity features that allow homeowners to control it in multiple ways. The locking mechanism is engaged by stepping on a manual lock pedal. The pedal activates a tamper free, high strength, security gate that lifts up to hold your door in place. The security gate can also be engaged via a Bluetooth key fob or by using your smartphone to control the lock. This lock is a flat security bar that rests at the bottom of doors and works to restrict access through the use of an elevated security gate. The absence of keyway and traditional keys negates the possibility of house lockouts, lock picking attacks or lock bumping attacks. The bar is made of steel, aluminum and glass filled nylon. This makes it strong and resistant to physical attacks. The lock is easily installed and can be attached to the base of any entry door. The installation process is relatively easy and hassle free. 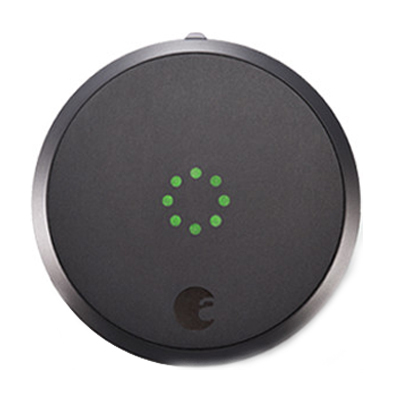 The Haven lock is can also be operated over BLE (Bluetooth Low Energy), which makes it a home automation favorite for homeowners that want the best keyless door locks. The lock has smart home integration capabilities. Forced entry alerts will let homeowners know if someone is forcibly attempting to break into their homes. The Haven lock does not work on doors that open externally. Yes. The Haven lock is not built like traditional locks, which means that it does not have the same access methods or vulnerabilities. This lock is operated by a mechanical foot pad or through a Bluetooth connection. The August smart lock is a staple in any conversation that revolves around keyless deadbolt locks or the best keyless door locks. It should be noted that the August smart lock has not always been quite so popular, but it has steadily propelled itself to the front of many users lists for best keyless door locks. Now, I will point out that if the focal point for the best keyless door locks had been security, the Haven lock would have won flat out. I mean, it is a lock that has proven itself to be 10 times stronger than your average deadbolt. However, when it comes to convenience, ease of access and the streamlined nature that homeowners look for in the best keyless door locks, the August smart lock has to be it. The August does not seek to replace your entire door lock, instead it merely wants to power the deadbolt that already exists inside of your door. This simple feature allows homeowners to pair their august with some of the strongest and best front door locks on the market. It takes your traditional lock and makes it keyless, which ensures that the lock cannot be picked. Works with your existing deadbolt. Homeowners can increase the strength of the deadbolt they are using to increase their security. Features remote access capabilities through the use of Bluetooth or when paired with a Wi-fi bridge. The lock is keyless which keeps it secure from lock bumping and lock picking attacks. The lock has auto-unlock and auto-lock features which lends itself to streamlining processes within the home. The smart lock cannot be controlled over Wi-fi connection without the presence of an additional network bridge. The August smart lock is a keyless door lock that looks to take over control of your existing deadbolt. The lock itself is controlled via smartphone. As the August smart lock website puts it, your smartphone is now your key. Keyless door locks have many benefits, chief of which is the convenience that comes with being able to ditch your keys and not having to worry that you might be locked out of your home. However, people often get caught up in the euphoria of convenience that they forget that door locks are meant to be a physical security measure. It is crucial that homeowners do not lose sight of security while trying to acquire one of the best keyless door locks.